Ecuador is firmly on the global ecotourism map thanks to the Galápagos Islands, which, while a compelling destination, are by no means the only reason to visit this country on the western coast of South America.Ecuador straddles the Equator, and encompasses an incredible range of habitats, from pristine Amazon rainforest to Andean highlands, with mangrove swamps, cloud forests, and jagged islands thrown in for good measure. This richness of ecosystems makes Ecuador the most biodiverse nation on Earth, and it also includes some remarkable oddities.If you visit the Andes, you’ll likely encounter the vicuña, a relative of the llama which produces the world’s finest wool – and the shearers have to catch them in the wild to obtain it. Then there are Julia butterflies which drink the tears of turtles and caimans, and marine iguanas who enjoy nothing more than a dip in the Pacific. With the country’s constitution actually recognising the rights of nature, there is every reason to be optimistic about the future of all the weird and wonderful wildlife of Ecuador.While you’re in the mountains, you can visit the furthest point on the Earth’s surface from the centre of the planet (the Chimborazo volcano). Back down at ground level, spend time browsing through the Otavalo market, where you can pick up beautifully colorful woven textiles. Ponchos are a popular choice when the cold mountain winds start to blow!The contrast with Yasuni National Park couldn’t be more marked. A stay in an eco-lodge here lets you immerse yourself in almost-untouched parts of the world’s largest rainforest, and you’ll be blown away by the sheer numbers and variety of orchids, butterflies and hummingbirds. This region is also home to tribes of indigenous people, some of whom are believed to still be uncontacted. 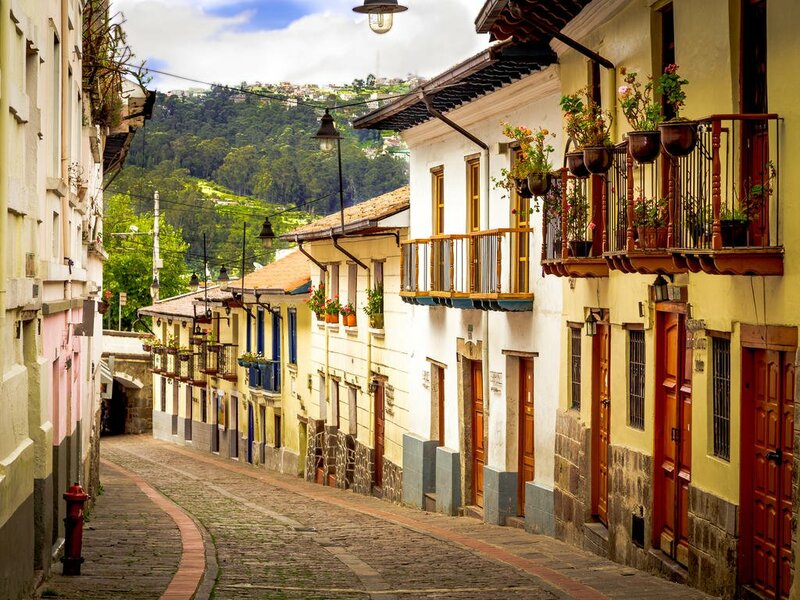 Your time in Ecuador wouldn’t be complete without going back in time and exploring the capital, Quito, and particularly its Old Town. Then it’s time to board your small cruise ship and follow the path of the sun across the ocean to the Galápagos Islands, known as the laboratory of evolution and perhaps one of the most remarkable wildlife experiences you can have anywhere. Electrical sockets (outlets) in Ecuador are very similar to the electrical outlets found in the United States and Canada, and if your appliance has a North American plug, it's possible that you won't need any adapter at all in order to plug in there. However, there are two potentially very important physical differences that may need to be addressed with an adapter: grounding and/or polarization. If your plug has one or both, and the socket doesn't, then the plug may not physically be able to fit into the socket without an adapter.In the case of a North American appliance plug, grounding is accomplished by the third, round pin beneath and below the two vertical blades on the plug. Polarization is accomplished by the left vertical blade being taller than the right, so that the plug can't be inserted upside down. U.S. and Canadian sockets are required to be both grounded and polarized. But in Central and South America, the Caribbean, Japan and other areas which use U.S. style sockets, grounding and polarization often are not required, and in fact, the majority of sockets in many of these areas do not accept the taller blade and/or the third grounding pin. This will prevent a North American appliance plug from being able to plug into these sockets, if the plug is either grounded or polarized.Electrical sockets (outlets) in Ecuador usually supply electricity at between 110 and 120 volts AC. If you're plugging in a U.S. or Canadian 120 volt appliance, or an appliance that is compatible with multiple voltages, then an adapter is all you need.But travel plug adapters do not change the voltage, so the electricity coming through the adapter will still be the same 110-120 volts the socket is supplying. If your appliance is from another part of the world, and it is built only for 220-240 volt electricity, or a Japanese appliance built for 100 volts, then a travel plug adapter by itself won't be sufficient. The voltage will have to be changed from 110-120 volts at the socket, to whatever voltage your appliance requires. This is accomplished with a voltage transformer. CurrencyUS Dollar (USD; symbol US$) = 100 cents. Notes are in denominations of US$100, 50, 20, 10, 5, 2 and 1. Coins are in denominations of US$1 and 50, 25, 10, 5 and 1 cents. Some coins are usual US cents and some are Ecuadorean centavos. They have the same value.There are no restrictions on the import or export of local or foreign currency. 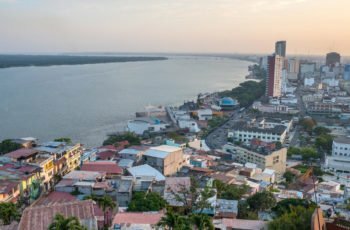 However, amounts exceeding US$10,000 must be declared.Foreign currencies can be exchanged at banks and at casas de cambio (exchange houses), the latter being generally the best option. It may be difficult to exchange money in the Oriente. The rate of commission varies between 1 to 4%, so it is worth shopping around.BankingBanking hours: Generally Mon-Fri 0830-1600/1700 and Saturday mornings.Major credit/debit cards are accepted in most businesses. ATMs are available at most banks in urban areas. On the Galápagos Islands, currently only Mastercard is accepted.ATMs are available at most banks in urban areas. Note that dirty or torn notes will not be accepted. Try to keep cash in smaller denominations; shopkeepers tend to refuse $50 and $100 bills as forgeries of these notes are common.Traveller's cheques are generally accepted in the larger cities and can be exchanged into currency at most banks and casas de cambio. It is advisable to drink only bottled or sterilised water in Ecuador. Avoid unpasteurised dairy products. Only eat well-cooked meat and fish. Vegetables should be cooked and fruit peeled.Ecuadorian dinner tables are blessed with some of the finest produce in South America; a testament to the country’s fertile soil, varied typography and wildly different climates.There are three main regions in Ecuador, each with its own style of cooking: highland cuisine revolves around warm, hearty dishes such as roast guinea pig and locro, a soup of potato, cheese, corn and avocado; coastal cuisine is dominated by seafood; and Oriente dinner tables typically feature rice, banana, yucca (a type of manioc root) and fish, including piranha. Most food isn’t spicy, but is inevitably accompanied by a bowl of aji, a hot pepper sauce for the bold to add at their peril. 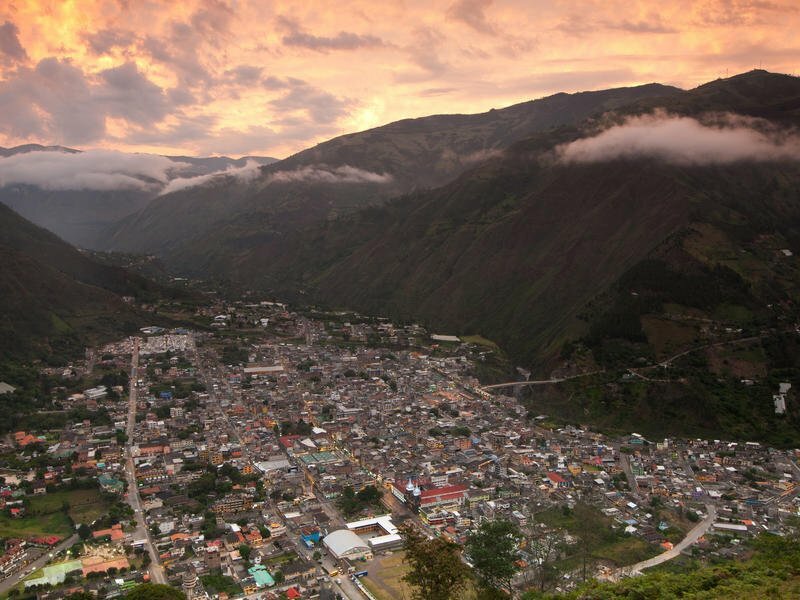 Ecuador’s geography presents a variety of distinct microclimates, which are largely determined by elevation. They are divided into 4 main zones:The area along the coast of Ecuador is referred to as La Costa, or the coastal lowlands. The coast has a tropical climate with hot and humid weather and temperatures around 80-90°F. This area can be enjoyed all year round, although it is cooler between June and November, when a sea mist known as garua sets in. 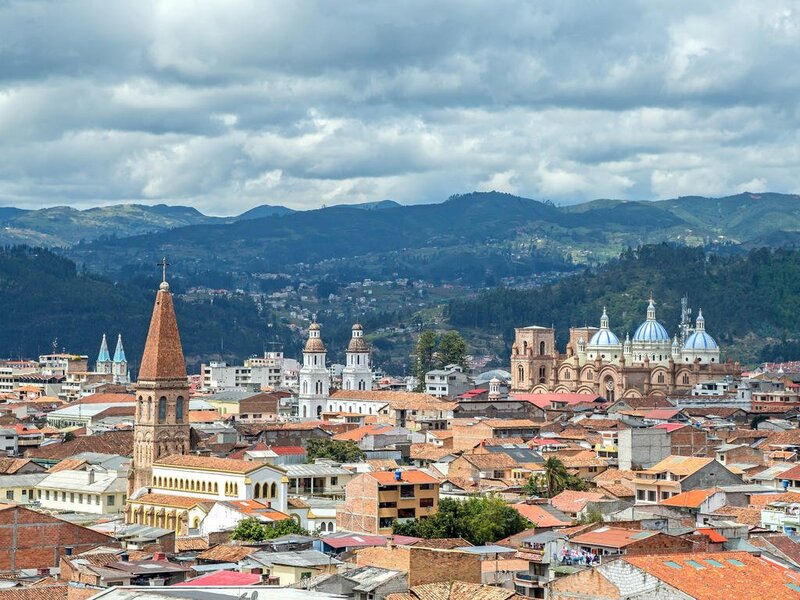 January to May are consistently the hottest and rainiest months here.La Sierra, or the highlands of Ecuador, are situated in the center of the country. 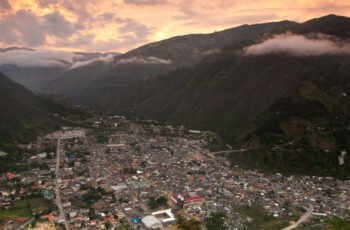 This region of Ecuador has a much cooler climate than other parts of the country, due to the altitude of the mountains. There is little variation by day or by season, however changes occur as you climb or descend.Beyond the Andes mountain ranges sits El Oriente, the Amazon region. This lowland rainforest is hot and humid with temperatures around 80-90°F. Steady rainfall is expected throughout the year, but it is wettest from March to September.The Galápagos Islands have an uncharacteristically dry and moderate climate for the tropics, marked by scarcity of rain and almost no extremes, average temperatures throughout the year range from the mid/upper 60s to mid/upper 80s. The Galapagos are also affected by garua between May and December; January to April here are the hottest months, with heavy but brief rainfall also possible.Taking all of this into account, Ecuador’s high season is June to early September. 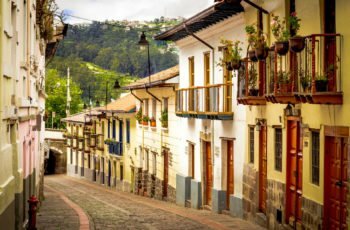 Ecuador is a small country and internal flight times are usually less than one hour, making air travel a quick and easy way to get around. 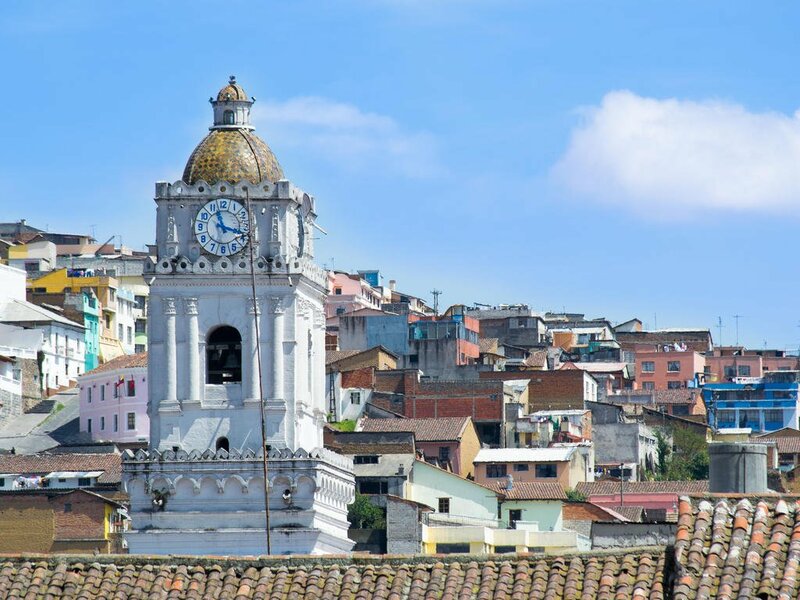 Most flights operate out of Quito although Guayaquil also has direct services to main centres such as Cuenca, Loja and Galapagos. TAME (EQ) (www.tame.com.ec) flies frequently between Guayaquil, Quito and other destinations throughout the country. The airline has recently launched direct flights from Quito to Tena, cutting out the 5 hour bus journey beween destinations. A number of small airlines serve the coast and eastern part of the country. Flying is the usual mode of transport for intercity travel.Galapagos Islands: There are daily flights to the Galapagos Islands on national airlines from both Quito and Guayaquil; note that airfares to Galapagos are much higher than to any other domestic destination, although there are discount fares on offer for Ecuadorian nationals and residents of Galapagos. There is also a national park admission charge, payable in cash only.If you don’t have a ticket there is the option to go along to the airport and join a waiting list for the flight as people frequently don’t turn up.Cars are driven on the right hand side of the road in Ecuador. The Panamericana or Pan-American Highway is largely in good condition; there are still plenty of potholes in places though and some roads are more akin to rough tracks. Roads in the highlands can be especially bad due to the weather and cracks or holes here can be sizeable.An extensive network of roads spreads out from the main north-south axis of the Pan-American Highway. There is a lack of road markings and signage, so driving at night is particularly best avoided.Since getting around by public transport is so easy, few people rent cars in Ecuador. 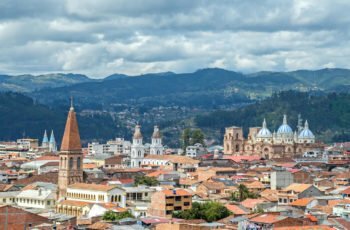 Nonetheless there are international and local car hire companies operating in Ecuador, with cities such as Quito, Guayaquil and Cuenca the places to arrange pick-up and drop off. It may be difficult to hire a vehicle in smaller towns and even in main cities you should arrange your vehicle hire in advance. 4-wheel drive is necessary for some areas.Drivers need to be at least 25 years old and have a major credit card for the deposit. Some companies will hire cars to those aged 21-25 but the surcharges are much higher. Check for existing damage and make sure the car comes with a spare tyre and a jack. Drive carefully, make sure the car is always secure and check what the car rental insurance policy covers.The national speed limit is 100kph (63mph) on highways and around 50kph (30mph) in urban areas, unless otherwise indicated. There are strong penalties for even the most minor driving offences. An International Driving Permit is not required, but insurance is.Taxis are widely available, particularly in larger cities and towns. Fares tend to be low but should be negotiated in advance. Taxis are metered in Quito, but rarely elsewhere. Taxis may be hired for a whole day. Drivers do not expect tips. All licensed taxis have a registration number prominently displayed.Increasingly popular, cycling is a good, if somewhat strenuous way of seeing Ecuador. Mountain bikes are recommended and you should ideally bring your own as bike hire services are scarce outside of Quito. Bring your own spares too. Bikes can also be taken on buses, canoes and almost every other type of transport if you find you’ve run out of energy. Organised bike tours in Ecuador tend to be one day trips, and mostly downhill, having been ferried to the top of the descent in a car by the company you book with.Ecuador’s bus and coach service is extensive and affordable. Taking a bus can be an exhilarating, exciting way to see the country although it can also be cramped and scary too given the recklessness with which some drivers tackle corners and overtake. There are a number of different companies throughout the country and services to almost anywhere that you might want to go. Some of the most established have their own bus stations separate from the main terminals (terminal terrestres) and operate air-conditioned, comfortable buses, ideal for longer distance journeys.Frequent landslides and lack of funding are some of the causes of Ecuador’s railway system becoming almost completely redundant. 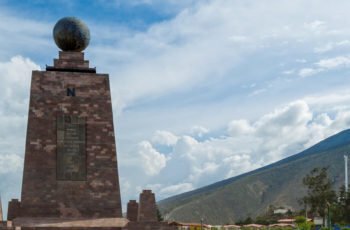 The Empresa de Nacional Ferrocarriles del Estado (Ecuador State Railways) runs the famous Nariz del Diablo (Devil's Nose), which makes a spectacular mountain descent on its route between Riobamba (tel: (03) 961 909) and Sibambe. The only other service of note is the weekend excursion from Quito to El Boliche, near Cotopaxi. Tickets for the Devil’s Nose ride can be bought a day in advance. Reservations for the Boliche service are not necessary. People tend to ride on the roof of the train for the most exhilarating experience.Ecuador's rocky coastline makes coast-hopping an inefficient and even dangerous means of transport for visitors. Several navigable rivers flow eastwards into the Amazon basin. Dugout canoes, which carry up to about 25 people, are widely used as a means of transport in roadless areas, particularly in the Oriente jungles and in the northwest coastal regions. Tourist boats, luxury cruisers, converted fishing boats and hired yachts can all be used to travel between the Galápagos Islands. Lightweight natural fabrics; rainwear in subtropical areas. Warmer clothes are needed in upland areas. Make sure that you have good-quality, well-broken boots with plenty of ankle support for trekking or walking on uneven terrain. ENTRY REQUIREMENTS Make copies of all your important documents such as passports, driver’s licenses, credit cards, etc. Keep copies with you and back at home. If anything is lost or stolen this will be a lifesaver.Passport:Passports must be valid for at least 6 months beyond the intended departure date. Please ensure you have at least one blank visa page (not endorsement pages) in your passport.Visa:U.S. citizens staying under 90 days in any 12- month period do not require a visa. 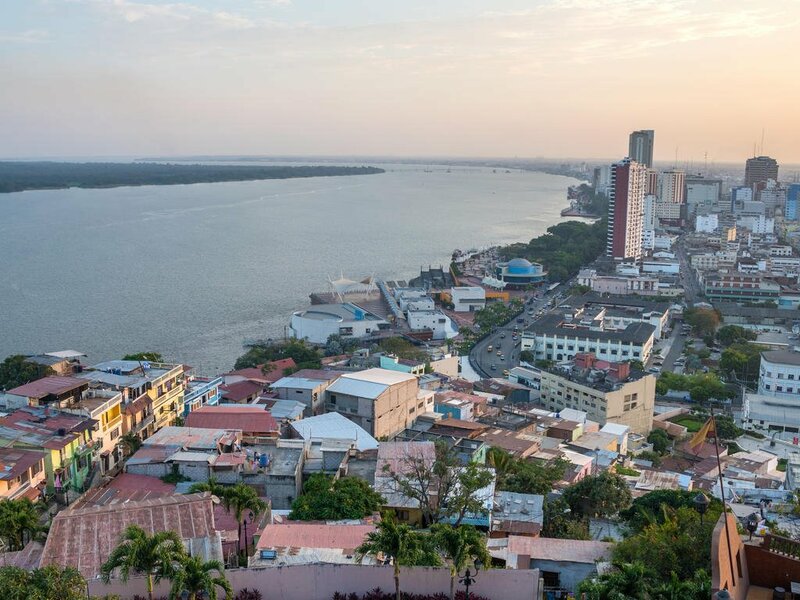 Non U.S. citizens should consult with your local embassy.Yellow fever certificate:A yellow fever vaccination certificate is required for travellers if traveling in the Amazon Basin or to other South American destinations or coming from a yellow fever infected country. It is otherwise not required or recommended. You should be vaccinated at least 10 days before you travel, as this will allow enough time for your body to develop protection against the yellow fever infection. Your proof of vaccination certificate will only become valid after this time.